As part of our obligation to the communities we serve, CGCR has made a commitment to donate thousands of dollars each year to T.A.W.C. We focus our charitable endeavors towards Autism research and therapies within the local community. Autism affects 1 in every 68 children and by bringing awareness to this cause we are hoping that we can help solve a tiny piece of this puzzle. 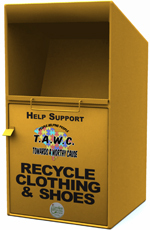 Carolina Green Clothing Recyclers takes pride in the way our display drop site containers look and function and as a sponsor, we appreciate and respect your support. 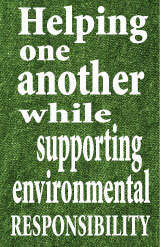 We welcome your involvement and look forward to helping promote your environmental business responsibility in your community.